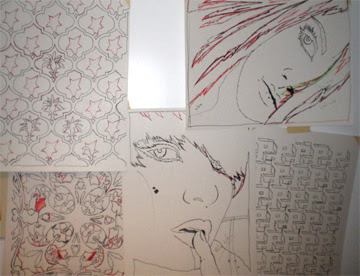 As the year comes to an end I decided to get a strong drawing session out for new pieces which will come in 2008. There are many things to come such as the group show for Art Whino on Jan 18th, and being published in the book Stencil Nation by Russell Howze (pre-Order Here) I am extremely excited for the new year and can’t wait for new projects to take on. So for now have a look at the drawing session and stay tuned for more news. Thank you to everyone for the support. 3 New patterns and two new regular stencil designs.